A Spanish saying goes: ‘Lentejas, si quieres las comes, y si no las dejas.’ (Eat the lentils if you want to, and leave them if you don’t), but neither of us would ever turn down a big bowl of hearty lentil stew! This classic, and ever so simple, recipe is designed to be eaten during a long leisurely Spanish lunch, but we think it’s great at any time of the day! 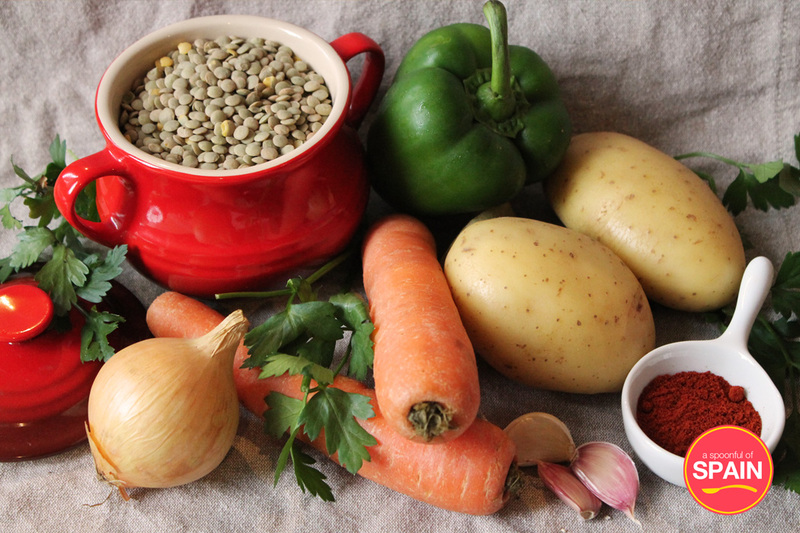 Lentils are a great slow-burning carbohydrate, packed full of protein and iron and so a bowl of this stew will give you the energy to power through the afternoon or chilly evening! Spanish lentils and chorizo stew is basic one-pot cooking at its finest. Although our recipe is simplified into four steps, it could easily be resumed as put stuff in a pot, and cook it! You will need to get started the night before, so put a note in your diary so that you don’t forget to soak the lentils. To jazz up the lentils at the table, we add a splash of white wine vinegar. It sounds weird, but trust us, it’s amazing! The night before you plan to cook your lentils, place your lentils in a large bowl and cover with water. The water should come 1-2 cm above the lentils. Leave overnight to soak. The next day, drain the water from the lentils and rinse them well. Add them to a large deep saucepan. Prepare the remaining ingredients – slice the carrots, chop the green pepper and onion into 1cm dice, mince the garlic and cut the potatoes into large chunks by slicing a deep cut into one side and using your fingers to snap off a piece of potato. This method releases more starch from the potato. Add the carrot, green pepper, onion, garlic and potatoes to the lentils in the saucepan, along with the chopped tomatoes and the stock cube. Add water to the saucepan until it is 2 to 3 cm above the rest of the ingredients (this was about 950ml for us), then add the olive oil, bay leaf and paprika to taste. Place the saucepan on a high heat and leave to boil. When it reaches a boil, turn the heat to low, cover, and leave to cook for 20 minutes. After 2o minutes, add the chorizo sausages, cover again, and leave to cook for a further 10 minutes. Check the potato and lentils to see if they are done, and leave to cook for another 5-10 minutes if they are still hard. If they are soft, serve immediately! We add a dash of white wine vinegar to our lentils for a kick, but this is optional. Welcome to A Spoonful of Spain! We are Sevi and Izzi, a Spanish/English couple with a love for traditional Spanish recipes. Get inspired by our classic recipes for an authentic taste of Spain! THANK YOU for this beautiful post! I’m very picky as to where I comment, I want reaaaal passionate food lovers, chefs,…but most important food enthusiasts….you guys capture this in your blog! Thank you very much Cathy! We are very glad that you like us! Thank you soo much for your support! I appreciate you very much! Continue your beautiful work! Thank you again!